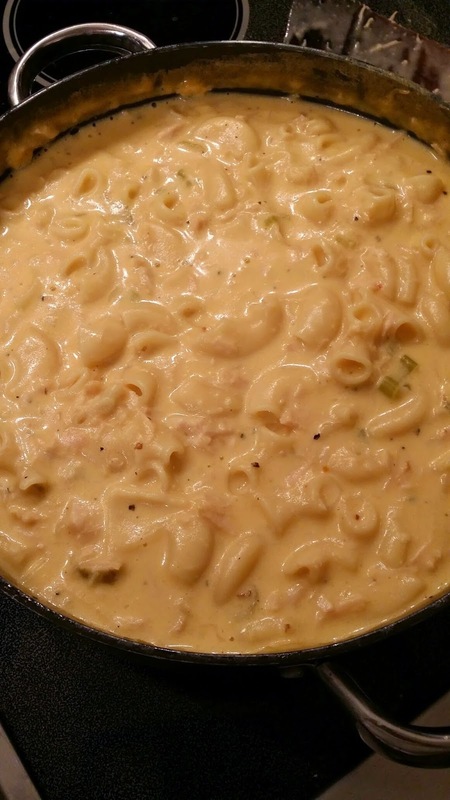 The Gentleman Crafter: Mama's Chicken Cheese Soup Revealed! I posted a picture of my very favorite soup on Facebook...like last week maybe. I promised I would get the recipe to you all. I think this would be a perfectly suitable post for today...ehhh? Now this soup isn't for the faint of heart or if you are trying to watch cholesterol or count calories...Just be warned! However, it is totally yummy anytime, but especially good on a cold night with some jalapeño cornbread. When you honestly think it can't get any better...heat it up the next day...WOW! (3) 10 ounce cans of chicken drained or or 3 chicken breasts cut into small pieces. al dente on this one...Once the noodles are cooked add in the cubed Velveeta until melted. Stir in chicken. Thanks, Guys!! I'm gonna give it a whirl!! Sounds like a good Texas supper to me. I'm with you on the butter, man. For me, bread is just a butter delivery device. ha! This sounds yummy! How much is a "stick" of butter though please? Do you think it can be made with a crock pot? My mouth is literally watering as I read this. I think you should post more of Mama's recipes, and Cesar's recipes, too. I've been hanging on to this recipe for just the "right time". I'm going to a weekend crop in a couple of weeks and I know the other "girls" will LOVE it!!! !